For supplemental heating of bedrooms, game rooms, family rooms and small areas in homes, apartments, condos and offices. Large area fins dissipate heat into a strong convection flow, delivering all available heat into the room. Low profile design and Navajo White color blends with any room decor. Built-in thermostat lets you maintain desired comfort level. Heater design produces gentle, radiant heat even after the thermostat's been satisfied. High-impact Lexan® and steel unitized body resists dents, scratches and rust for long cabinet life. Specifically designed welded bar grille provides protection against insertion of foreign objects. 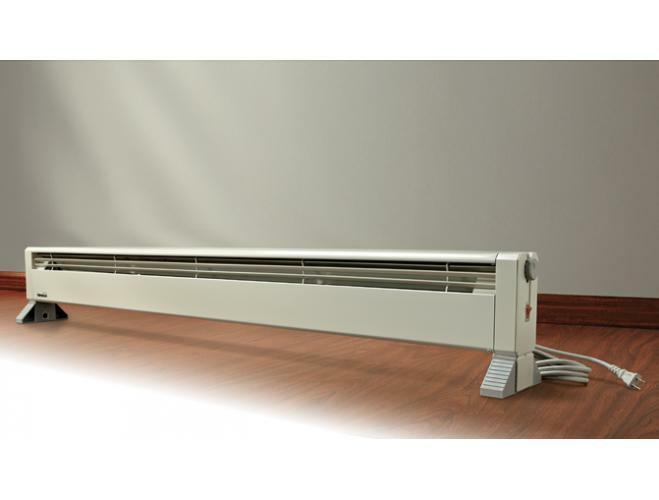 Linear high temperature cutout safety checks the entire length of heater and will automatically shut off heater in the event of accidental air blockage. Large copper element reservoir maximizes heat retention.